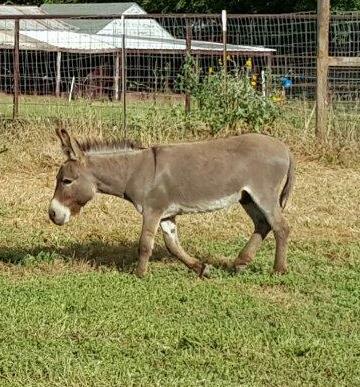 When King Ranch and I bought this property, we had written into our contract that we would be assuming the ownership of a donkey named Bunny. Prior to our ownership, Bunny lived as the security guard for 6 horses. That’s what they’re bred for—donkeys—to watch over the herd and protect them from animals such as coyotes, wolves, and bobcats. Bunny, we were told, had previously fought off a bobcat and now bears a long scar on her back leg as proof that it’s no easy job. Despite their ability to stomp out snakes and buck intruders into oblivion, donkeys are gentle and lovely creatures. They’re social and thrive on companionship. So when Bunny’s 6 horses moved away to their new home, she became desperate for attention. 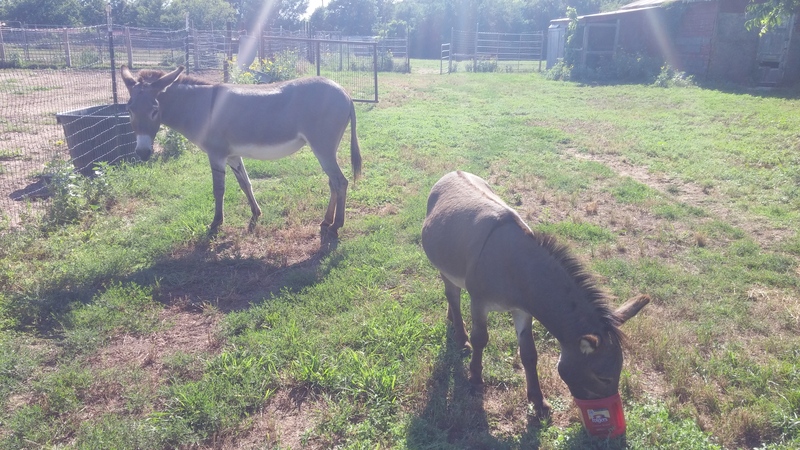 King Ranch and I did all kinds of reading about donkeys and what they need to thrive and throughout all of our research, we learned that one donkey is harder to take care of than two or more solely because of their dependence on friendship. Without a partner (or several) they do things like chew on fences out of stress, gnaw obsessively at their legs, and only sleep for two hours a night due to lack of a snuggle-buddy. It became clear that we needed to find a friend for Bunny. And quickly. King Ranch, Little Foot, and I arrive at a satellite location for the Humane Society of North Texas in apprehension and excitement that we may be meeting our newest family member today. As we pull in, the rich smell of livestock welcomes us to a safe-haven for the bruised, battered, and brave animals that have held on long enough to hopefully find new homes. Horses neigh. Donkeys bray. Tails are flicking and lips are flapping. It’s a vast acreage of hodgepodge hope and happiness—all these surviving equine sharing stories and hay. We’re greeted by a warm woman named Jo—bright, blonde hair and speckled cheeks—who walks towards us from around the main house. A dark, gray Great Dane with swollen eyes follows behind her with his tongue dangling down below his floppy jaw. She tells me recognizes my voice from the phone call I made to them earlier in the day and leads us under the rusted, iron fence and out into the pasture where the potential adoptees are grazing. We hike quite a ways out. Horses taller than King Ranch lift their heads from the scattered piles of hay. They continue to chew—their manes falling down over their eyes—following us with their gaze as we pass them one by one. Some even follow us for a few steps but fall behind once they realize we’re not there for them. Every animal that we pass has a story and Jo knows them all. She points at a towering, terracotta horse with a light, tan mane standing next to a smaller, beige horse with dark freckles on its back-end. She pats the speckled one on the rump and I stop briefly at the larger one. I look into his (or her, I’m not sure) eyes and they’re a bottomless brown of memories all swimming and swirling around the past. I hold the gaze for a moment, hoping that he or she connects with my reassurance that good things are to come before patting his or her nose and moving on to catch up with my pack. I like making eye contact with animals. I don’t really know what it must mean to them, but my hope is that they will feel seen. There are several donkeys of all shapes and sizes walking and jogging around the edges of this property. They all stick together and are skittish towards us. As we walk towards them, they scatter and reconvene with one another at a safe distance. Jo points them out one by one, telling us their names and their stories. She describes their personalities—some shy. Some aggressive. Some real old and some real young. Jo says, “We also got a mini.” She jerks her head, motioning back up towards the house. “A mini?” I ask, looking at King Ranch who has a sideways grin. “Yup,” she says, “back up this way.” She scratches the back of her neck beneath her long, frizzy, blonde hair and clears her throat. King Ranch adjusts Little Foot on his waist and we follow Jo back towards the entry. As we hike back, Jo continues to tell us survival stories of the horses, donkeys, and mules that we pass. She had taken the time to get to know each of them. Back at the main house is a small pack of mini ponies—6 of them. They are all a beautifully groomed brown with long, luscious, blonde manes that hang down below their necks like capes—a lollipop gang of neighs, snorts, and uncontrollable cuteness. The ponies are not up for adoption—rather, they make trips to local schools and hospitals to cheer up children. They have a job. On the edge of the mini-pack, with a flicking tail and and a long row of spiky hair down his neck is a single mini donkey. His knees are swollen knots on stubby legs and is gray with a cross on his back, just like Bunny. As we approach, he screeches an epic bray—his mouth wide open with all of his teeth showing. It doesn’t zig-zag like Bunny’s but instead, his sound is jagged steel being pulled across the cement. He is perfection. Pure, pint-size perfection. “What happened to Ernie?” I ask. Bert snorts, stomps his tiny back hoof, and shuffles away with his head down to catch up with the pack of mini horses that have started to wander away. They all keep their little backs turned to him, yet, he follows optimistically. “He sure is trying to get along with these ponies,” I say. King Ranch and I make giddy eye contact. Even Little Foot is grinning, showing his 4 teeth. King Ranch raises his eyebrows and tilts his head to the side. He agrees. This is the one. Back at the property, we let Bert in through the side gate. Bunny’s ears point straight up and her eyes are wide with curiosity. As soon as Bert trots into the yard, Bunny takes off into the back of the property snorting. King Ranch asks, “Do you like the name, Bert?” His nose wrinkled a bit. “I think we should call him Tyrion” he says, grinning. King Ranch and I had just finished catching up on HBO’s popular series, ‘Game of Thrones’ based on the equally popular books by George R.R. Martin. In this series, one of the only consistently sympathetic characters among a host of other really terrible people is a little person named Tyrion (pronounced Tee-ree-un). We’d become big fans of this show. Tee sees Bunny and slowly approaches. Bunny is frantic, retreating as far from him as she can. This game of distance goes on for two days. Tee follows Bunny around the yard and Bunny runs away from him. This frustrates me because we thought she’d enjoy a companion. King Ranch assures me that it’s okay and will just take time. On the third day, Little Foot and I go out into the pasture with a coffee can full of apple treats. Both Bunny and Tee saunter up to us, taking turns nibbling treats from my hand. I’m thrilled to be touching them at the same time. After the treats are gone and the face rubs are given, Bunny and Tee wander off together and I catch Bunny touching her nose to his. It’s quick. But it happened. Since then, Bunny and Tee have been inseparable. They follow each other all day. If one begins to bray, so does the other. If one rolls in the dust, so does the other. They’re the best of friends and frankly, Bunny has never looked healthier. For Bunny, her grounding has come from Tee. Perhaps any other donkey would have done the same thing for her, but perhaps not. Maybe Tee was her anchor and any other donkey would have only made things worse. Who knows. Either way, there’s no doubt that Tee has completed our family here at the ranch. He’s trotted into all of our hearts, braying like a maniac and kicking his tiny little legs, and it’s never felt more like home. Twice a week, I drive into town to teach a yoga class at a local studio. It’s a half hour each way up and down through rolling hills on two-lane country roads. Cows and long-haired horses graze behind a mix of white picket, barbed wire and, chain link fences. On this particular trip into town, it’s partly cloudy with just enough sunshine peeking through to flick glitter on the morning dew and just enough to show off the yellowish-brown filth blanketing my windshield. Little Foot is asleep in his car seat and I’ve made it fifteen minutes into the commute before realizing I haven’t turned on any music. Forty miles per hour, winding up and down and around makes having a stick-shift vehicle even more enjoyable. I sometimes shift gears just to feel impressive. I’m on the part of the drive where the road climbs up a surprisingly steep hill and then curves sharply to the left behind some trees when suddenly: a medium-sized turtle is crossing the road. Here’s the thing about parenthood – the split-second decision is a far more chaotic scene than before. The flip-book of consequences that you speed through when these moments of quick-action arise must now include a whole extra chapter of potential outcomes that include your child. This extra chapter is different, however. What was formerly a quick-flip of realistic options when needing to make a fast decision (for example: Action 1 = Good Outcome or Action 2 = Bad Outcome…now choose your action) has now become an endless pit of despair where your child either ends up being taken away from you by CPS because of your neglect for their safety or your child ends up joining a gang because he feels safer with them and gets tattoos of bullets across his face. In other words: Action 1 = Good Outcome and Action 2 = Bad Outcome, Your Child Is Going To Hate You and Action 3 = This Will Surely Cause Your Child To Catch an Incurable Disease That’s Never Been Heard Of and Action 4 = The Mob Will Steal Your Child, Run Off To Peru And Raise Him As An International Assassin and of course Action 4 = OMGWTFTHEWORLDISGOINGTOEND. Normally, I would pull off into the grass, check both ways, run and grab the turtle, and drop him on the other side of the road. But as I’m cruising up this hill, I’ve made it into the second chapter of chaos whereby my pulling over would end in either my Little Foot getting hurt (I cannot describe this as I’m welling up just thinking about it) OR a fiery crash, a headline news story, a mug shot, and scheduled, supervised visits with my child who would rather play his Nintendo DS than play with me. So I drive on. I pass the turtle. And I cry because I’m filled with guilt for not stopping to help. I’m in fear that after I teach this class and am driving home that I’ll see the mush of turtle remains in the middle of the road reminding me of how I failed him. I spend the next several minutes searching for meaning – bouncing from pride in my abilities to protect my child from potential harm to grief over the inevitable demise of the turtle. I think of Little Foot and although his car seat is still rear-facing so I can’t see him, I am imagining him. His head, no doubt, tilted to the side with his bottom lip protruding in sleep. His dimpled hands lightly holding his giraffe. I wonder what he must be dreaming about. What do babies dream about? I remember the day he was born like it was yesterday. I remember every speck of detail. King Ranch was on my left and the night nurse on my right. Between every push, King Ranch’s job was to put the oxygen mask back over my nose and mouth. I was on oxygen because my heart was struggling with a slow beat. My heart was struggling, I believe, because the brightest light that the world has ever known was about to enter it and take his first breath. It was struggling because for 9-months, it obsessed over the safety of that growing baby and had grown so attached to it and now somehow, was required to push him out into the contaminated public where he would have to be shared with everyone. It was struggling because although love is the heart’s specialty, it hadn’t known how to love like this before. I think it was slowing down because it was afraid to let go of him. When Little Foot finally came into this world, I was watching King Ranch’s face. The sleepless circles under his deep, brown eyes instantly disappeared as the corners of his 5 o’clock shadow-surrounded mouth pushed his dimples up into his cheek bones. His whole body sank an inch – no doubt bowing under the pressure of pride. He was the most handsome I had ever seen him. I followed his gaze and saw Little Foot’s eyes. I remember how surprised I was with how almond-shaped they were. My heart struggled, but this time it was too fast. It was so afraid yet so excited. It wanted so badly to wrap itself around this new human whose fingerprints were one of a kind; whose lungs had just begun to share the air with the rest of ours for the first time. As the nurse placed his tiny, wet body on my bare chest, I made a deal with my aching heart that I would guard this child with my entire being. That I would do anything and everything I could to keep him safe just like my heart had been doing for months. I poured this promise so powerfully into my heart that I believe it welled up out of my chest and into Little Foot’s brand new and un-scarred heart. I’m thinking of this day when I notice my heart is throbbing. I realize I’ve driven on auto-pilot for 10 minutes and have shown up at the yoga studio. As quickly as I can, I pull Little Foot’s car seat out of the back because all I want to do is squeeze him and assure him that everything is okay. He’s rubbing his eyes as he wakes up. He sees me and smiles. I smile. He’s safe. In his contentment and my panic, I realize I’m the one who needs to be convinced that everything is okay. On my drive back home, I approach the part of the road where I’d passed the turtle. Thankfully, there is no spot or mush on the pavement. He made it across. Everything is okay. Every day, we’re faced with difficult choices, even if they seem trivial. And sometimes, we might not make the right choices. You can’t control the turtle crossing the road if it means risking the safety of your child in the back seat. You have to make those hard decisions. But I guess what is important is that we’re always trying to do the right thing. And we’re always trying to do our best. After all, if you’re giving it your best – if you’re trying to do the right thing, then that’s all you can really do. And it’s all going to be okay. It always will.